Grow your own delicious fresh pineapples on your windowsill - from the same plants used for commercial pineapple production in South America. The perfect plant for a sunny kitchen or conservatory windowsill, needing little care and attention save a little water and the occasional feed. Each plant is delivered with a pineapple fruit already growing so your plant is guaranteed to fruit this year. Once the fruit is removed an offset will appear which may fruit in following years and an entirely new plant can even be raised by cutting off the leaf crown and planting in compost. Supplied at 50cm tall in 14cm pot, already in fruit - not to be confused with the smaller ornamental types available online. Here's a real novelty indoor plant that will provide interest every day as you see your own deliciously sweet pineapple develop atop this well-established, potted plant. A member of the Bromeliad family, it's the perfect indoor plant for a sunny kitchen or conservatory windowsill, needing little care and attention save a little water and the occasional feed. 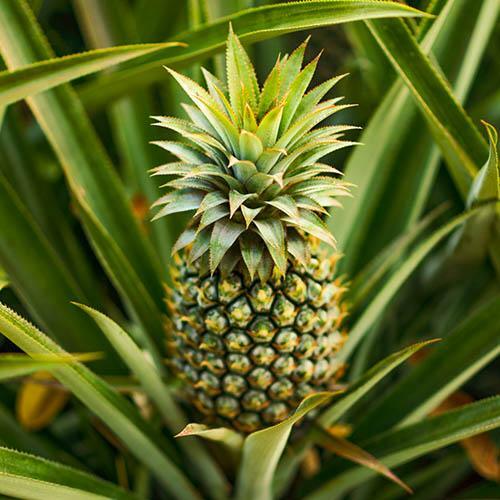 The plants are exactly the same as those used in commercial pineapple plantations across the world, so you can be assured of the best tasting fruit - right here in the UK on your windowsill. Do not confuse these big specimens with tiny decorative, non-edible plant available elsewhere online. Each plant is delivered with a pineapple fruit already growing so your plant is guaranteed to fruit this year. For best results water the compost keeping it moist and also keep a little water in the cups of the leaf rosette. When the pineapple is plump and ripe (about the size of an orange) remove and enjoy! Once the fruit is removed, an offset will appear which may fruit in following years and an entirely new plant can even be raised by cutting off the leaf crown and planting in compost. Supplied as an established plant in a 14cm pot, already in fruit, approx 50-60cm tall. As your plant matures, it may begin sending offshoots from the base. These can be carefully removed and potted up individually. Pineapples prefer full sun, so give them plenty of light. Water your plant regularly and don't allow it to dry out. Being tropical, pineapples will not grow in cooler, drier weather, although never allow them to sit in water. Your pineapple should be watered from the top like other bromeliads. Feed with a weak (1/4 strength) liquid fertilizer throughout the growing season.